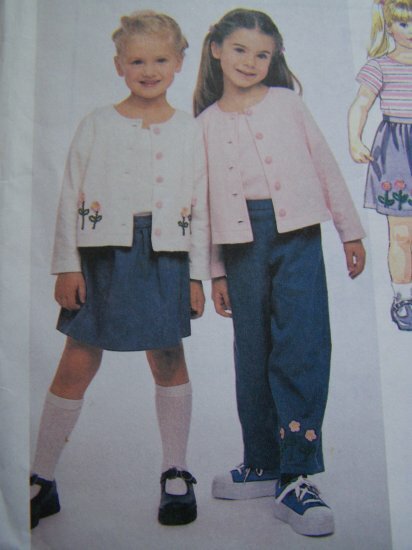 McCall's toddler girls uncut sewing pattern # 2307. Girls toddler sizes 2 - 3 - 4. Back to school clothing Cardigan, top, pull on pants and skort. Cardigan has long sleeves and front button closure; top has short sleeves and back button closure, pants and skort have front waistband and back elastic, applique also included. More new, vintage and out of print sewing patterns listed. Last one in this size. I have this in size 4 5 6 in another listing. Measurements: Breast - chest 21 - 23". Waist 20 - 21". Hip open - 24". Suggested fabrics; Lt wt fabrics such as - Cotton and cotton blends - challis - denim - chambray - cotton knits. Cardigan and top also in sweater knits. S & H to USA is $2.00 first class. I use priority flat rate envelopes for $5.00 shipping and can fit a lot of patterns inside. S & H to Canada is $3.50.